Need to check multiple numbers? when exporting fine French wines. You should check the validity of the customer’s VAT registration number when zero-rating supplies to VAT registered customers in another Member State. Checks on the validity of a customer’s number should be made using the Europa website. When making an enquiry on the Europa website you must identify yourself by entering your own VAT registration number and print out a record of the date and time that the enquiry was made and the result of the enquiry. If it later turns out that the customer’s number was invalid, you will be able to rely on the validation record as one element to demonstrate your good faith as a compliant business and to justify why you should not be held liable for any VAT fraud and revenue losses which occur. 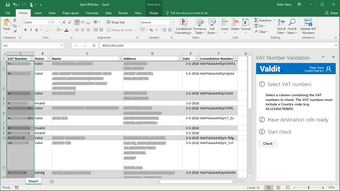 This is free data validation service offered by Valdit. You’re allowed to use this services as much as needed for the purpose of handling zero rate supplies by your business. We are offering this service as a showcase for our upcoming Valdit VAT Alert service. VAT Alert is a service for making automated enquiries to the EU VAT VIES system and maintain records of enquiry for you. We need your VAT number to make the enquiry on your behalf. We are keeping record of your own VAT number and email address that you enter if you decide to receive a PDF print out of the enquiry we’ve made on your behalf. We will use this information to send you a notice when our VAT Alert service is launched.